, a learned bishop of Ely, was descended of a very ancient family, which came originally from Denmark. 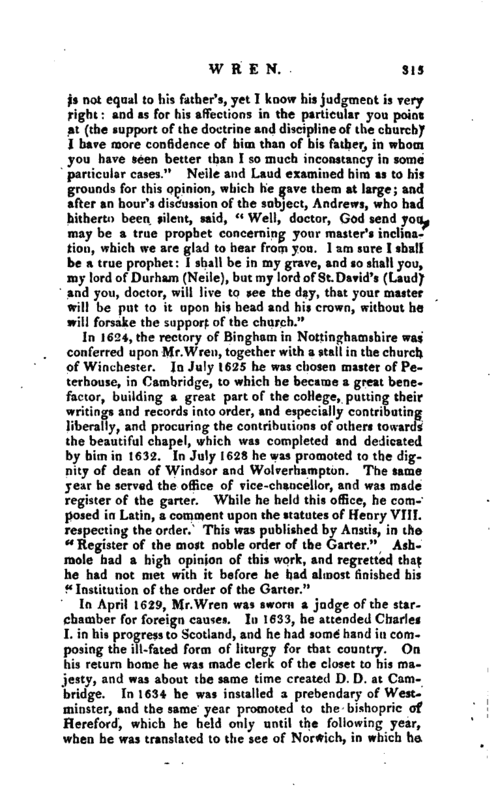 His father, Francis, citizen and mercer of London, was the only son of Cuthbert Wren, of Monkskirby.in Warwickshire, second son of William Wren of Sberbume-honse and of Billy-hall in the bishopric of Durham: but the chief seat of the family was at Binchester in that county. Our prelate was born in the parish of St. Petercheap, London, Dec. 23, 1585. 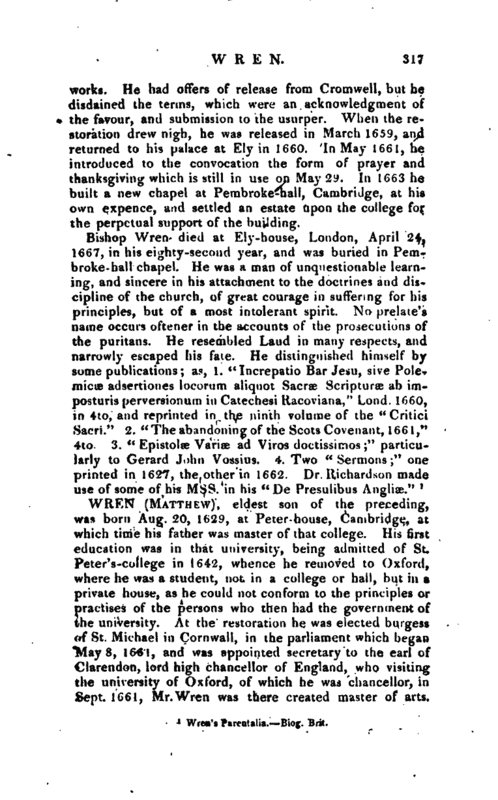 Being a youth of promising talents, he was much noticed while at school by bishop Andrews, who being chosen master of Pembroke-hall in Cambridge, procured his admission into that society June 23, 1601, and assisted him in his studies afterwards, which he pursued with such success as to be chosen Greek scholar, and when he had taken his batchelor’s degree was elected fellow of the college Nov. 9, 1605. He commenced M.A. in 1608, and having studied divinity was ordained deacon in Jan. and priest in Feb. 1610. Being elected senior regent master in Oct, 1611, he kept the philosophy act with great applause before king James in 1614, and the year following was appointed chaplain to bishop Andrews, and was presented the same year to the rectory of Teversham in Cambridgeshire. In 1621 he was made chaplain to prince (afterwards king) Charles, whom he attended in that office to Spain in 1623. After his return to England, he was consulted by the bishops Andrews, Neile, and Laud, as to what might be the prince’s sentiments towards the church of England, according to any observations he had been able to make. His answer was, “1 know my master’s learning | is not equal to his father’s, yet I know his judgment is very right: and as for his affections in the particular you point at (the support of the doctrine and discipline of the church) I have more confidence of him than of his father, in whom you have seen better than I so much inconstancy in some particular cases.' 7 Neile and Laud examined him as to his grounds for this opinion, which he gave them at large; and after an hour’s discussion of the subject, Andrews, who had hitherto been silent, said,” Well, doctor, God send you may be a true prophet concerning your master’s inclination, which we are glad to hear from you. I am sure I shall be a true prophet: I shall be in my grave, and so shall you, my lord of Durham (Neile), but my lord of St. David’s (Laud) and you, doctor, will live to see the day, that your master will be put to it upon his head and his crown, without he will forsake the support of the church." In 1624, the rectory of Bingharn in Nottinghamshire was conferred upon Mr.Wren, together with a stall in the church of Winchester. In July 1625 he was chosen master of Peterhouse, in Cambridge, to which he became a great benefactor, building a great part of the college, putting their writings and records into order, and especially contributing liberally, and procuring the contributions of others towards the beautiful chapel, which was completed and dedicated by him in 1632. In July 1628 he was promoted to the dignity of dean of Windsor and Wolverhampton. The same year he served the office of vice-chancellor, and was made register of the garter. While he held this office, he cornposed in Latin, a comment upon the statutes of Henry VIII. respecting the order. This was published by Anstis, in the <c Register of the most noble order of the Garter.“Ashmole had a high opinion of this work, and regretted that he had not met with it before he had almost finished his” Institution of the order of the Garter." In April 1629, Mr.Wren was sworn a judge of the starchamber for foreign causes. In 1633, he attended Charles I. in his progress to Scotland, and he had some hand in composing the ill-fated form of liturgy fur that country. On his return home he was made clerk of the closet to his majesty, and was about the same time created D. D. at Cambridge. In 1634 he was installed a prebendary of Westminster, and the same year promoted to the bishopric of Hereford, which he held only until the following year, when he was translated to the see of Norwich, in which he | sat two years and a half, and appears to have been very unpopular with the puritan party. Lord Clarendon informs us that he “so passionately and warmly proceeded against the dissenting congregations, that many left the kingdom, to the lessening of the wealthy manufacture there of kerseys and narrow cloths, and, which was worse, transporting that mystery into foreign parts.” But the author of the “Parentalia” says, “that this desertion of the Norwich weavers was chiefly procured through the policy and management of the Dutch, who, wanting that manufacture, (which was improved there to great perfection) left no means unattempted to gain over these weavers to settle in their towns, with an assurance of full liberty of conscience, and greater advantages and privileges than they had obtained in England.” This author commends his modesty and humility, particularly in never seeking preferment: but he says too little of his zeal, which was indeed, ardent and active. This drew upon him the unjust imputation of popery. Nothing seems to have rendered him more hateful and invidious to the parliament, than his standing high in the favour of his sovereign. 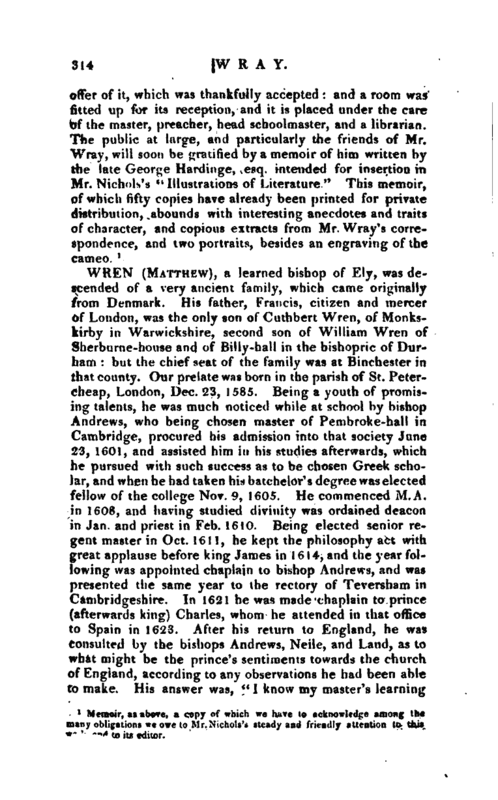 In 1636 he succeeded Juxon, as dean of his majesty’s chapel, and in May 1638 was translated to the bishopric of Ely. He had not enjoyed this above two years, when in Dec. 1640, the day after the. 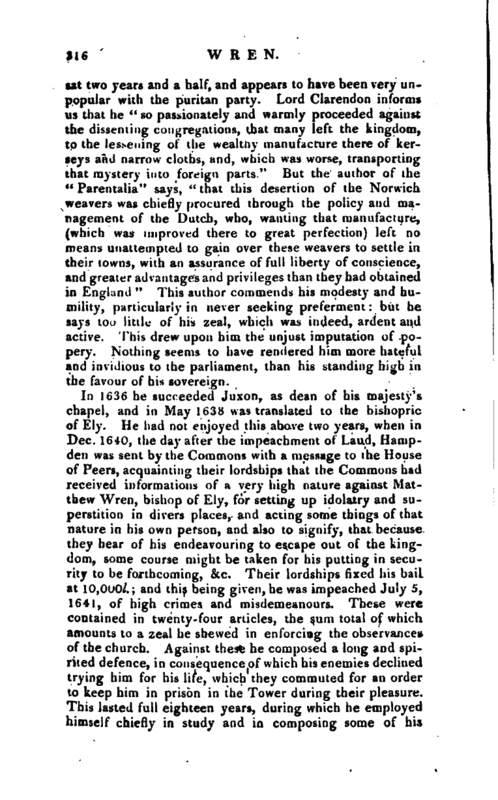 impeachment of Laud, Hampden was sent by the Commons with a message to the House of Peers, acquainting their lordsbips that the Commons had received informations of a very high nature against Matthew Wren, bisbop of Ely, for setting up idolatry and superstition in divers places, and acting some things of that nature in his own person, and also to signify, that because they hear of his endeavouring to escape out of the kingdom, some course might be taken for his putting in security to be forthcoming, &c. Their lordships fixed his bail at 10,0001.; and this being given, he was impeached July 5, 1641, of high crimes and misdemeanours. These were contained in twenty-four articles, the sum total of which amounts to a zeal he shewed in enforcing the observances of the church. Against these he composed a long and spirited defence, in consequence of which his enemies declined trying him for his life, which they commuted for an order to keep him in prison in the Tower during their pleasure. This lasted full eighteen years, during which he employed himself chiefly in study and in composing some of his | works. He bad offers of release from Cromwell, but he disdained the terms, which were an acknowledgment qf f the favour, and submission to the usurper. When the restoration drew nigh, he was released in March 1659, and returned to his palace at Ely in 1660. In May 1661, he introduced to the convocation the form of prayer and thanksgiving which is still in use on May 29. In 1663 he built a new chapel at Pembroke-hall, Cambridge, at his own expence, and settled an estate upon the college for the perpetual support of the building.